Pad Thai made with green papaya strands in lieu of rice noodles has been around for a while; I have just recently come to appreciate it. For me, the turn around point was when I ceased seeing green papaya in this context as a low-carb, low-calorie, grain-free noodle substitute and came to acknowledge it as an ingredient that tastes great on its own merit in this newer version of Pad Thai. I would be stating the obvious in saying that green papaya doesn’t taste anything like rice noodles; “the chew” and the carby comfort just aren’t there. But what green papaya brings to this classic dish is the crunchy freshness that is surprisingly pleasant. Pad Thai Ari restaurant (ผัดไทยอารีย์), lauded as one of the best Pad Thai restaurants in Bangkok , makes outstanding green papaya Pad Thai. It was at this place where I discovered the joy of this unorthodox version of one of Thailand’s most famous dishes. Huge, huge river prawns with rich tomalley that come with it are a bonus. 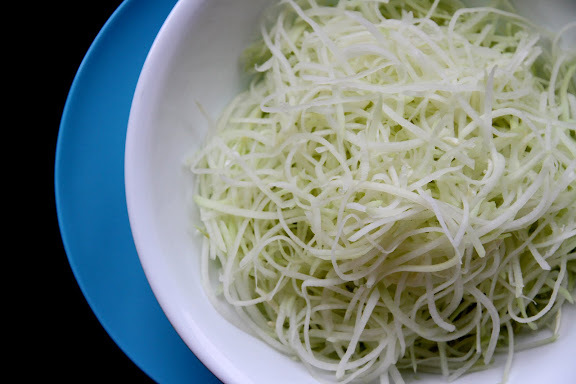 To make green papaya Pad Thai, simply grate green papaya into thin strands as shown. My earlier post on Thai Green Papaya Salad (Som Tam) may come in handy here. Note that while it’s more traditional to grate green papaya with a large knife (I always cheat, though) when you make Som Tam, that method doesn’t work well in this case. You want long, thin, noodle-like strands that can only be achieved with the use of a hand-grater. A nice thing about green papaya is that it’s much more forgiving than rice noodles when it comes to Pad Thai. No soaking is required. No need to monitor the heat or the rate of absorption and evaporation so closely. There is no starch that would cause gumminess. All you have to do is make sure you don’t overcook the papaya to the point where it’s too soft, assuming, of course, that you like your papaya fresh and somewhat crunchy. Follow my Pad Thai recipe exactly, replacing 4 ounces of dried noodles which the recipe calls for with one pound of grated green papaya strands. Pad Thai Ari was named such because of its original location on Soi Ari (Phahon Yothin 7). The restaurant has recently moved to a new location nearby (it still retains its original name). To get there, take the BTS to Ari station. Exit on the side of Thai Farmers Bank (Kasikorn). Walk north for a few yards. Enter a small soi right next to the north side of the bank, and the restaurant will be on your right, a few steps away from the soi entrance. Alternatively, you can enjoy this dish at Pad Thai Ari’s storefront at the Emporium food court. It’s kind of nice to eat this in an air-conditioned environment while enjoying the view of Benjasiri Park next door. I am so excited about the idea of using green papaya as noodles! I love pad thai but I think it is a heavy sometimes, so I am happy about this fresh version. Thank you for the inspiration! Wow – I must have been living under a rock because I’ve never heard of using green papaya to replace noodles for pad thai. Sounds incredible! The level of freshness must be worth the missing noodle texture. Thanks for sharing! looks wonderful as your website does .I have to try this! am used to cooking Pad-Thai and tom-yum soup and some Panang-Beef. 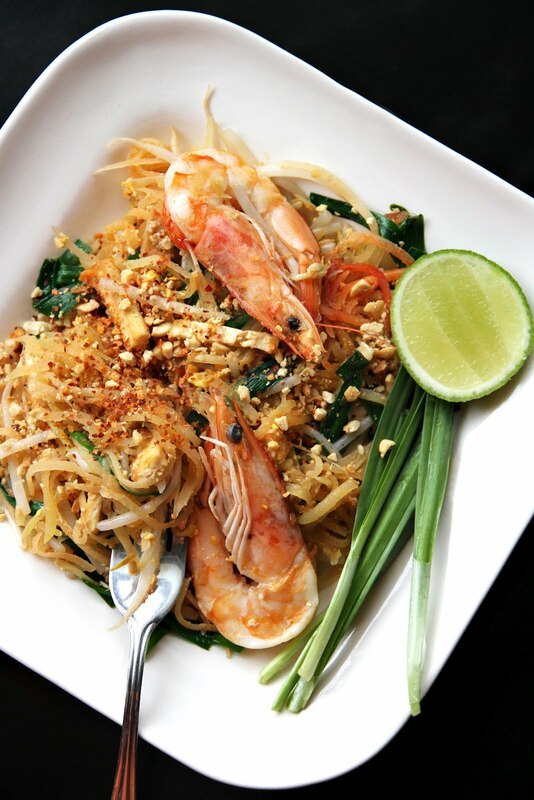 Green Papaya offers authentic Thai cuisine in a sleek, elegant setting. This version of pad Thai forgoes the usual noodles and makes use of thinly sliced green papaya. Thanks! Thank you Leela! I made this for my mum today, she loves pad thai, but she’s sick and couldn’t handle the heavy-bloated stomach so when i made this for her with half a papaya it was demolished! :)Super quick to make as well, Addicted to your site!